Reference number for this case: 3-oct-54-Marcoing. Thank you for including this reference number in any correspondence with me regarding this case. 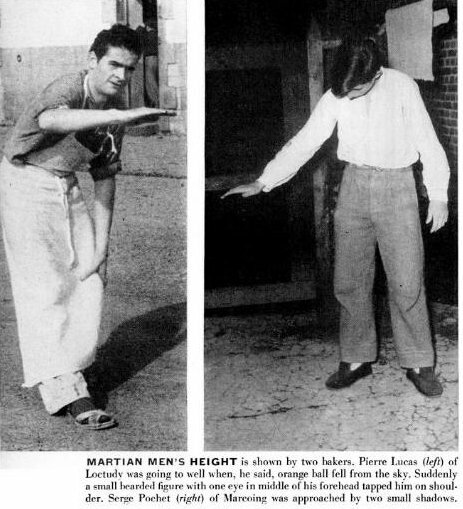 The newspaper reports on October 6, 1954, with no other information, that there was a sighting in Marcoing. The date is not given but the sighting is mentioned among others that took place on October 2 and 3, 1954. Bakers apprentice Serge Pochet was approached by 2 small shadowy entities, about 3-feet tall. No other information. Donald Johnson says that on October 3, 1954, a humanoid report occurred later than 6:45 p.m., in the night and did not involve a UFO sighting: young baker's apprentice S. Pouchet, was approached by two small shadowy beings, about three feet tall, in Marcoing, Nord, France. The sources are noted as "Webb, David F. & Bloecher, Ted. HUMCAT: Catalogue of Humanoid Reports, case A0271, citing Life Magazine, November 1, 1954" and "Life Magazine, November 1, 1954". In "Special notes" of their catalogue, the GNEOVNI group indicates that there exists in several books, such as Aimé Michel's "M.O.C. ", Planète publishers in 1966, in which there is a number of observation cases in the Nord and Pas-de-Calais which are not included in their catalogue because there "remains much doubts as to their credibility." One of them is noted "3-10-54 Marcoing nord". 1.2 Patrick Gross June 3, 2010 Addition [la1]. 1.3 Patrick Gross July 7, 2010 Addition [gn1]. 1.4 Patrick Gross July 14, 2010 Addition [li1]. 1.5 Patrick Gross October 3, 2014 Addition [ta1]. 1.6 Patrick Gross February 11, 2017 Addition [ub1].